This latest catalogue offers not only our long established product range but a new chapter in Sontay's sensor evolution. Our new line in sensor housings offer a slee, uniformed look which will add a streamlined aspect to any installation. Matrox Graphics Inc. announced that its flagship Matrox Mura™ MPX Series video wall controller boards are compatible with NetLinx® Integrated Controller systems from automation solutions provider AMX. With the development of a free Mura MPX-specific module for the NetLinx® user interface programming language, AV integrators are now able to easily integrate Mura MPX boards with AMX systems and create custom video walls for use within a wide range of industries spanning such sectors as retail, government, and process control. The Newer Technology Power2U AC/USB Wall Outlet is the convenient and energy-efficient in-wall solution for powering and charging USB devices. Now you can charge and/or power up to four devices at once when using the USB 3.0/2.0 ports and standard three-prong outlets, while eliminating unsightly clutter created by multiple cables and bulky power adapters. Ideal for users of multiple USB chargeable devices, the Power2U AC/USB Wall Outlet is a basic "DIY" install on any 15Amp circuit with a 16 cubic inch electrical box** to blend seamlessly into the wall as a standard power outlet. A "straightforward" rated "how to" video demonstrates how the Power2U can be installed in as little as 20 minutes. The Green Light Power Meter (GLS-EM-MCU) logs overall electricity usage in real time. Facilities managers and building owners can now accurately measure and monitor all electricity coming into the building. It measures and tracks actual energy consumption by attaching to the incoming electrical service and branch circuits. The GLS-EM-MCU also works in unison with the GLS-EM-CTI and GLS-EM-CT to provide more detailed data by tracking individual branch circuits in a home or office. Actual power usage data is then transferred to a Crestron control system over Ethernet where it can be displayed on a touch screen, laptop, or Apple® and Android® mobile devices for easy viewing. Armed with this substantial data, rather than estimates, managers can make intelligent and informed energy savings decisions across the building and campus. The new FG series (The Beast!) of Open Automation Controllers from EasyIO are the new range Internet ready Field Controllers. They comprise of combined Area Controller capabilities and features, as well built in I/O and huge data logging capacity. All packaged as the future solution for the Internet of things in Energy and Building Facility Control. The controller also supports multi concurrent protocols and services such as BACnet, Modbus, TCOM, Web Services and both Server and Client services. This new range complies with the ‘Internet of Things’ by interfacing directly to Cloud Services without an additional Gateway or Server. To power the application, the FG has a dual ARM processor engine and also a built-in Web Server. Lascar Electronics has introduced a new addition to its temperature data logging line, the EL-ENVIROPAD-TC. A thermometer for spot temperature readings with built-in data logging and graphing functionality, this robust and easy to use handheld device takes and records temperature readings via the K-type probe supplied with the unit. The EL-ENVIROPAD-TC has two key functions - data logging and spot measurement. When in data logging mode, the EL-ENVIROPAD-TC can be set and left to take temperature readings at pre-determined intervals for a desired length of time. When in spot measurement mode, the unit can be used as a thermometer to capture-one off temperature readings displayed on the screen. 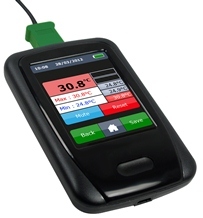 The unit is capable of holding over 65,000 readings in CSV format downloadable to PC via USB connection and is compatible with any J, K, N and T-type thermocouple - not simply the probe supplied. Crestron introduced its new 16-Port Managed Power over Ethernet (PoE) Switch. Built to handle today's ever-expanding home and commercial networks as more sophisticated devices are connected, CEN-SWPOE-16 delivers a business-grade PoE switch that enhances high performance control networking in the most demanding environments. Featuring PoE on every port, remote management/monitoring of each port, touch screen control capability, and PoE+ for running power-hungry Type 2 devices, CEN-SWPOE-16 makes it easy to deploy a high-speed network of IP-enabled control processors, touch screens, DigitalMedia™ switchers, computers, mobile devices, audio processors, media servers, IP cameras, and other Ethernet devices. Using a single rack space, all 16 Gigabit capable ports supply maximum bandwidth for HD digital AV distribution and critical control data, providing an integrator-friendly end-to-end Crestron control solution. A new DIN-rail mount ETHERNET 2.0 ECO Telecontroller expands WAGO Corporation’s Smart Grid-Ready I/O portfolio. Based on the ETHERNET 2.0 Controller with SD Card, ECO Telecontroller supports Smart Grid integration of small, localized renewable energy producers. Compact and cost-sensitive, these producers accommodate a limited amount of I/O; however, utility incorporation relies on collecting precise network states. The ECO Telecontroller facilitates this by converting signals via connected I/O into utility-friendly, IEC-compliant data. Packing an integrated Ethernet switch and dual Ethernet ports, 750-880/0025-0002 ECO TeleController maximizes space within compact substation control cabinets. ECO TeleController’s SD Card Memory Expansion slot supplements 1 Mbyte of data memory with up to 32 Gbytes of additional memory. It also allows transfer of device parameters or files, e.g., boot files, from one controller to another. For more information visit http://www.wago.us. RLE’s FMS is a comprehensive monitoring system commonly used to monitor equipment status and environmental sensors. Feature-rich and budget friendly, the FMS is currently used in data centers, labs, telecommunications facilities, and museums around the world. Designed to be vendor neutral, the FMS aggregates information from a wide variety of sensors and equipment and then displays it through an onboard web interface. The FMS also allows aggregated data to be pulled to other systems, all without additional servers or software. The FMS is engineered without any internal moving parts – no hard drive, no fans. This means no downtime, no lost data, and no scheduled maintenance. It stores and displays all its own data and hosts its own web pages. Great onboard features include data trending and extended logging, interactive graphical facility mapping, PUE/DCiE monitoring, and nesting, which allows one FMS to report conditions from a large collection of related FMS units. A new rugged and reliable rain sensor is being used to automatically close vents and windows. Limitations in previously available sensor technology has made this seemingly simple task very difficult. Hydreon Corporation of Minnesota has introduced the RG-11 Optical Rain Gauge. With the RG-11, applications such as greenhouses, agriculture, and louver vents are enjoying simple and effective ventilation, and properly closing the ventilation in the event of a downpour. In some cases these systems can replace far more costly and less efficient air conditioning systems. The RG-11 Rain Gauge is an optical sensor, and is sensitive to even tiny amounts of rain. In contrast, rain sensors used in irrigation do not detect rain until several millimeters have already fallen. That is far too insensitive for most window-closing applications. Further, and in contrast to other sensing technologies, the RG-11 stops sensing rain when the rain stops. It does not need to wait for the water to evaporate. For more information visit http://www.rainsensors.com. NK Technologies introduces DS1 DC Current Sensors. DS1 current sensors feature a compact and non-adjustable one-piece design to deliver reliable detection of very low DC current levels in a wide range of applications. Their compact and non-adjustable one-piece design simplifies installation, even in crowded control cabinets. DS1 current sensors can be powered by any DC voltage between 10-28 volts and use the same circuit as the one being controlled, or a separate source of voltage to power the sensor as long as the circuit being controlled uses the same ground. This further simplifies installation and operation when compared with other current sensors.